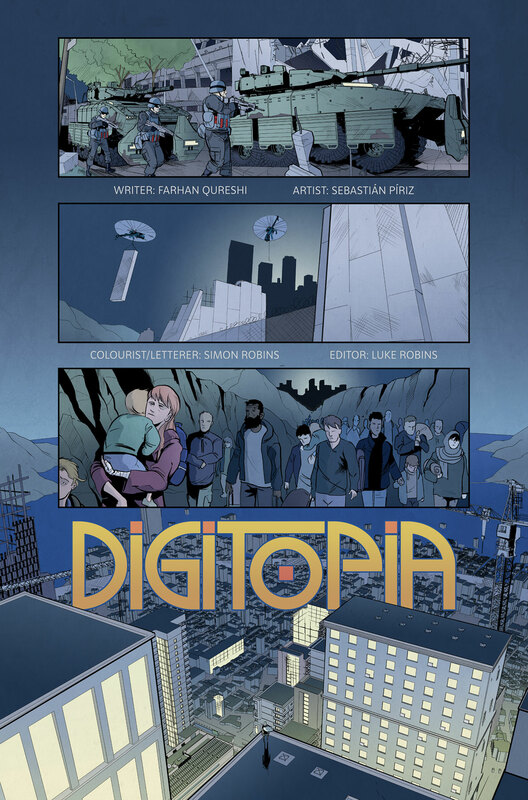 Hey welcome to page seven of ‘Digitopia – The Web Comic’, so if you’ve been following from the start (click here to go to page one), you’ll notice now this is what we call the transition phase of the story. 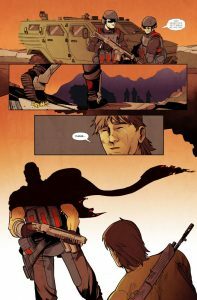 In the first six pages we’ve set up the story, we’ve set up the world and the main problem our hero faces, here we are now jumping forward in the story to the present day – the ironic thing about this page, is that is was never written at all. 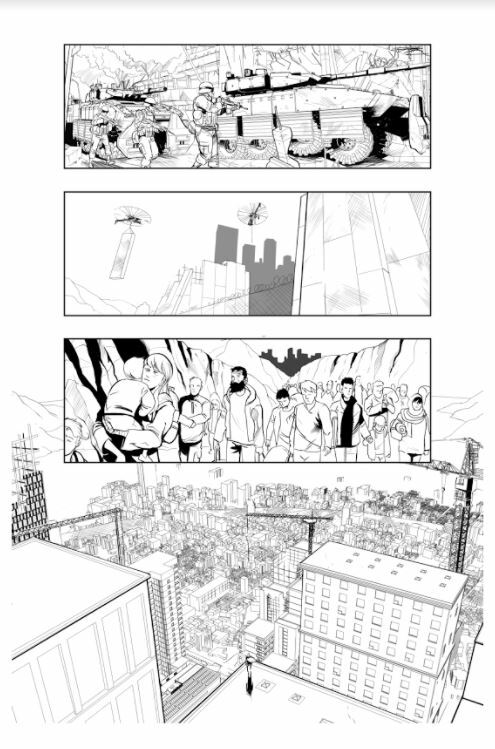 If you’ve been following along with the blog posts below each comic so far, you’ll notice I always put the blocking, the inks against the original script – well here there was no original script to paste in below – because we never initially wrote this page – this page has come out purely from collaboration from the team. We were trying to find a way in which we could show the passing of time and what has happened to Digitopia in the story. I can’t quite remember who in the team came up with the idea (we’ll call it group synergy for now :)) of telling the transition of time with the tanks rolling in and the Digitopians rolling out of Digitopia. 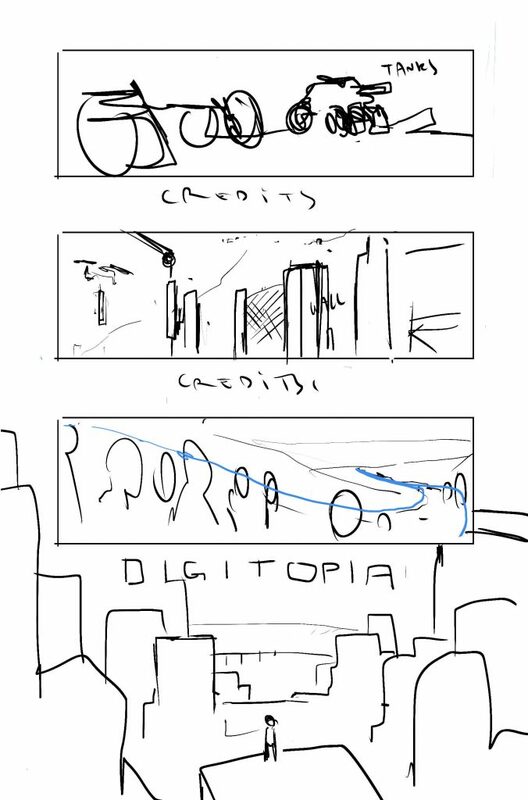 We then augmented the idea showing the New Digitopia being built with iron walls coming down. We wanted a way to show that Jay is now all alone and placed him at the bottom of the shot, using the new city-scape, sea and mountains extending into the distance. In terms of setting the next stage of the story we shifted the colour palette from a yellow-red palette that you’ve seen in the first six pages (i.e. in Old Digitopia) to a steel blue palette showing a much colder industrialised structure being forced onto the new City. You can see the same artist work but being applied with different colour strokes helps take us away to a new path in the story. Be sure to hit the ‘Like‘ buttons to let your friends know about the web comic, if you haven’t already do use the subscribe form below to be the first to know about the next part of the adventure, exclusive behind the scenes looks at the comic and find out how you could get yourself a printed version too. Have look around the site while you’re here too.